1. Is it some kind of preaching? Well, its just Krishna and Arjuna talking to each other. The reader is the third person. Aren't you curious what they were up to? 2. It is a very big book, will take months to read! The actual conversation is small. 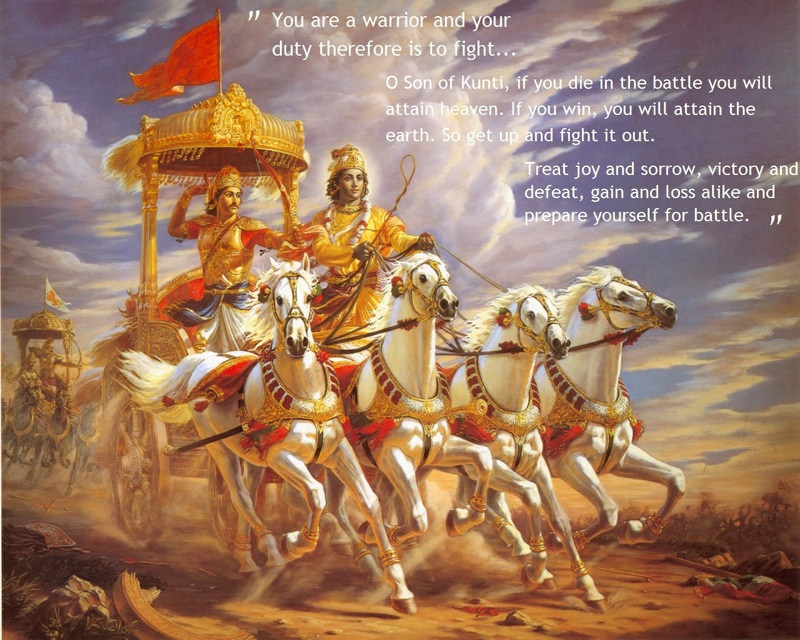 Bhagavad Gita is a dialogue which took place between Krishna and Arjuna before commencement of a war. It took place for a couple of hours. Its the explanation given by many authors that makes the book look big. Even if you cannot understand Sanskrit, the translation is good enough. 4. What are its contents? For the ease of understanding, the Bhagavad Gita has been divided into 18 chapters by the ancient Rishis; each chapter revealing and unfolding many unknown mysteries and wisdom. 5. Bhagavad Gita promotes violence? It is a teaching of non-violence amidst war! An act without hatred is what Bhagavad Gita propounds. The Bhagavad Gita epitomizes the correct action - of righteousness, of upliftment of spirit and an action or duty that ought to be performed even in the most compelling situation. In the last 5150 years of the existence of the Bhagavad Gita, there is no evidence of someone becoming a terrorist after reading it. In fact, Mahatma Gandhi wrote commentaries on the Bhagavad Gita and it was an inspiration for his non-violent movement. The Bhagavad Gita is a unique scripture which caters to the entire range of human evolution, comprising every level of this vast existence. 6. What makes Gita unique? It is the unfolding of the highest wisdom amidst war. It is the scripture of bravery in both realms of physical and metaphysical. Bhagavad Gita helps one transcend one's identity, encourages reason and infuses wisdom. Bhagavad Gita stands for poise and equanimity and for performing one's designated duty. 7. Anyway, before I read, tell me what is Lord Krishna upto in the Gita? Arjuna was angry, upset, sad and wanted to run away. In the Bhagavad Gita, Lord Krishna said not to be a coward. Lord Krishna said, "Bravery is the way - face the war when it is inevitable and do your duty." Lord Krishna went step by step to deal with Arjuna's emotions, ego, mindsets and concepts. He finally touched on the nature of his spiritual being; revealing him the highest knowledge and making him realize his eternal nature. This brought him enormous strength and then propelled him to perform his worldly duties. Every time you grab the Gita, it fills you with new nectar of knowledge and wisdom.